Down 1-0 in games, Ar-We-Va rallied to pick up a 3-1 victory over Paton-Churdan in Rolling Valley Conference action on Tuesday night at Westside. The 20-25, 25-19, 25-17, 25-20 triumph moved Ar-We-Va to 2-0 in the RVC, 5-5 overall in matches and 15-13 in games played on the year. Emilee Danner paced Ar-We-Va with 19 kills, adding five digs, five solo blocks and two ace serves in the match. Jadeyn Smith contributed nine kills, six digs and two ace serves. Emily Hinners followed with seven kills and one block assist. Sara Schurke had 31 assists with two ace serves. Bridget Cameron tallied nine digs with three ace serves. Hannah Kraus had six digs with one ace serve and Leslie Luft wound up with five digs and one kill for the Rockets. "Paton-Churdan has a lot of great players and good hitters and really gave us a challenge. 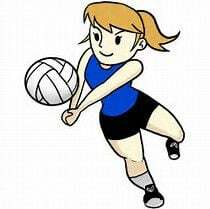 I was glad that the girls accepted the challenge and fought for every point until the end," commented Ar-We-Va coach Amber Hoffman.